In this new edition of the story behind the beloved Christmas poem, Moulton and Winget create a beautiful keepsake. Written from the oral history provided by Clement Moore’s great-great-great-granddaughter, Ms. Dinghy Sharp, Moulton captures the spirit and wonder of “The Night before Christmas” through poetry similar in rhyme and meter to the original. Moore wrote the original as a gift to his sick daughter. He never dreamed it would become the beloved classic that it is. The author begins with Ms. Sharp’s firsthand memories of her grandfather, then has the grandfather relate his memories, and on back. Much of the language in the original is outdated, and Moulton deftly explains terms like “coursers” and why Papa needed to tear open the shutters and throw up the sash. Moore himself was known as Papa and was sought out to tell stories to children. Why did everyone hang the stockings by the chimney? 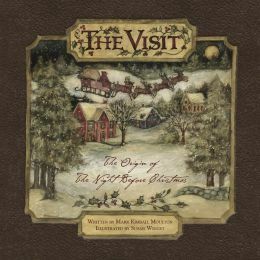 The description of Saint Nicholas and the sleigh came directly from Moore’s neighbor and the sleighs used of the time. Winget’s gorgeous illustrations make the book a memento. Readers will feel part of the worlds of 1936 and 1822 and can spend hours looking at the details in the pictures. The book works well as a read aloud for small children and as an independent reader for late second to early third grade readers. Possible reading activities include learning about the first Saint Nicholas, a poetry unit, and discussing family oral history. The author’s website (http://www.markkimballmoulton.blogspot.com/) highlights this book and his other work.